On Wednesday 3/10/2018 the Norwegian Union of School Employees (Skolenes Landsforbund, SL) visited Eterotopia. 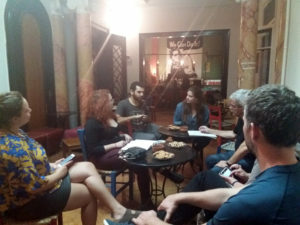 The meeting consisted mainly of a briefing on Eterotopia’s participation in the ‘’Solidarity Schools’’ project, the so called “Courses for All’’. The union’s delegates were shown round Eterotopia, with the attention being directed to the library and the classrooms where the solidarity courses take place. In addition, the delegates were duly informed of the principles behind Eterotopia’s functioning, by its very members. Delving into the aforementioned, our goal as member of Eterotopia is to meet up every month in two different assemblies. 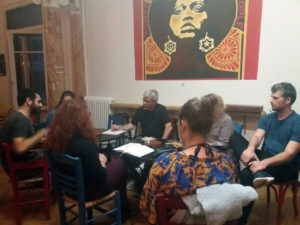 The first assembly pertains to the planning of the monthly program of Eterotopia which, for the most part, includes movie nights, solidarity cooking, cultural and political events. The second one deals with the “Courses for All”’s affairs: organizing the timetable, communicating with students and their families, but also cross-checking the students’ overall performance, to name a few. Interest was also shown on how it would be possible for a place like Eterotopia to be economically viable, especially when its only source of income is the profits from its bar and the “Kitchen of Solidarity” project (everyone is welcome to come and enjoy a full meal at Eterotopia and only pay an optional symbolic fee to support Eterotopia, if they feel they can afford it). We offer Eterotopia’s space to bands, theatre groups, artists and scholars to set up their own events so as to express themselves freely, on the single condition that anyone be able to attend free of charge, measure put already into effect for all of our activities. The participation in the “Courses for All’’ team during the 2-day meeting of Solidarity Schools was another topic of conversation. 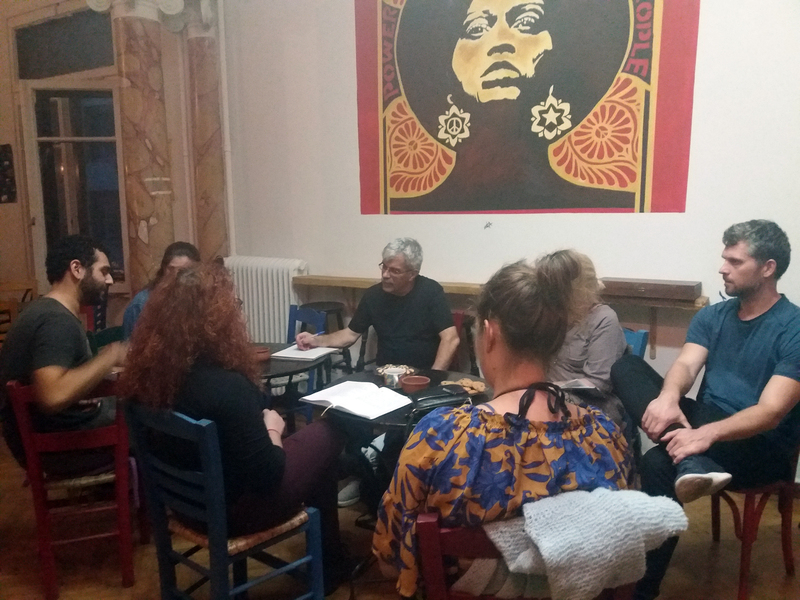 We are more than happy to work together with grassroots organizations and movements supporting causes ranging from LGBTQI rights to the fight against a disastrous gold mining operation in nearby Halkidiki. Furtheremore, we have been active in assisting refugees both here in Thessaloniki and in other locations where we felt we were needed, such as Eidomeni’s camp. As far as our action in the Solidarity Schools’ project is concerned, 34 teachers and 88 students currently participate in free classes, with the subject ranging from Sciences and Foreign Languages to Music Classes and Theatre. Sciences and humanitarian classes are popular among High School students and adults who wish to sit for the national exams in order to ensure a position in the University. The delegates noticed that the “workforce” of Eterotopia and “Courses for All” project are mostly of young age. Among us there are professional teachers, undergraduate and postgraduate students that provide teaching hours free of charge. The most experienced of us give the younger guidelines and teaching material. On behalf of Eterotopia, we are always delighted to be visited by delegates of associations that support the various gradations of the teaching process. We strive to bond with groups that recognize the need for public education to be altered and boosted. Our goal is to help our students, utilizing a plethora of means, confront the intensification of today’s training model and make their dream come true, regardless of skin color, nationality or religion. That goal can only be achieved by co-operating on the enhancement of public education.